Description The AW95 is an improved design of the Adams-Wilson Hobbycopter, which goes back to the late 1950s when T.G. Adams and P. Wilson designed and built a prototype of the XH-1 Hobbycopter. The idea was not to sell helicopters, but only their designs, with all of the manufacturing and assembly being the responsibility of the buyer. The same is still true for the AW95 today. This is probably the cheapest way to build a helicopter. In the new design, the swash plate and skid landing gear were improved to simplify the building process, and obsolete components and materials were replaced by newer ones. The rotor blades are a design of A/B Helicopters’. 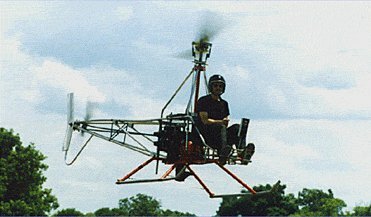 The A/W95, and therefore the Adams-Wilson Hobbycopter, is based on an all open-welded tube framework, making it a very basic helicopter indeed. The AW95 is an improved design of the Adams-Wilson Hobbycopter, which goes back to the late 1950s when T.G. Adams and P. Wilson designed and built a prototype of the XH-1 Hobbycopter. The idea was not to sell helicopters, but only their designs, with all of the manufacturing and assembly being the responsibility of the buyer. The same is still true for the AW95 today. This is probably the cheapest way to build a helicopter. I want to buy this helicopter,can you deliver in Manchester (ENGLAND)please tell its price and import duty payable in England My E-MAIL adress is jmahmud5@gmail.com An early reply will be greatly appreciated. Regads Javed Mahmud. Thank you to answer me by mail and tell me the address where it is visible! Merci de m'indiquer l'adresse où il est visible . Hello I ' m searching for a used aw 95 . Can anyone make an offer to me? Do you want to comment the Adams-Wilson A/W 95 helicopter?